More than half of the 160 BHS stores that closed after the retailer fell into administration a year ago are still sitting empty - revealed in research we released earlier this week. Bringing to an end 90 years of trading for the famous British chain, research from LDC shows that 60% of the stores still remain empty with no plans for re-occupation. In an interview with BBC Radio Scotland, Matthew Hopkinson, Director at LDC, explains why these big, often multi-storey retail spaces are difficult to fill. 16 out of 160 were located in Scotland and none have been re-occupied yet. Matthew highlights the fact that the ex-BHS units span over multiple floors and occupiers that would usually take up units with large floorspace have moved out of town (i.e. Next and M&S). Another reason for the difficulty in filling the empty BHS units is "many of them have been occupied by BHS for decades and there’s a vast cost involved in redeveloping them" says Matthew. What could we do about these BHS units? Could they be re-purposed into a multi-use space, combining retail with gyms, pubs, restaurants and even hotels? Matthew also reveals to BBC Radio Scotland the kind of retailers that have moved into the empty BHS units so far. To find out more, listen to the interview by clicking here or the image below and forward to 1:44:00. Emma Simpson, BBC Business Correspondent also covers the BHS story on BBC News taking us to Bexleyheath Shopping Centre where a new department store, Morleys, opened in the former BHS unit. There, Emma interviewed two former BHS employees that currently work at Morleys and shared LDC data with her audience before handing over to Matthew to explain why only 25 out of 160 stores have new owners. 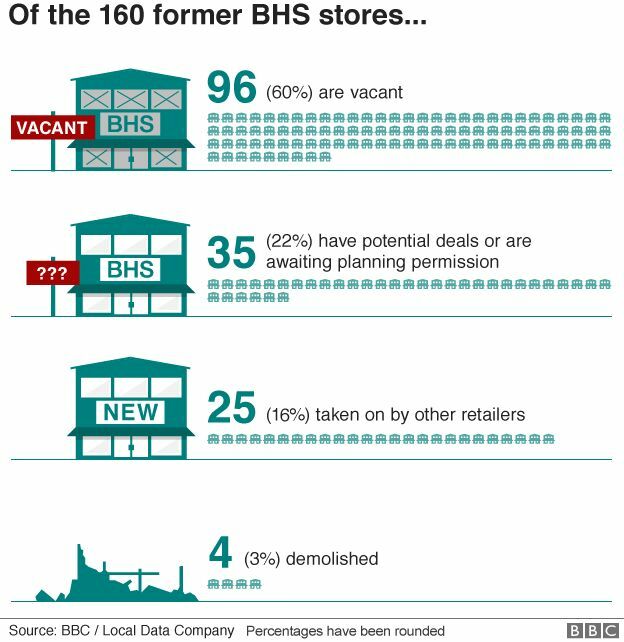 More details on this story can be found in this BBC article "Mixed picture for BHS stores one year after closure".